The join between the teeth and the gum is a nice niche for bacteria and plaque to accumulate, so it is important to target this area. Remember. 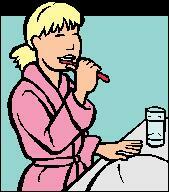 You are trying to penetrate the bristles into the gaps between teeth to remove very soft plaque. It is important to only move the toothbrush up and down (not side to side).